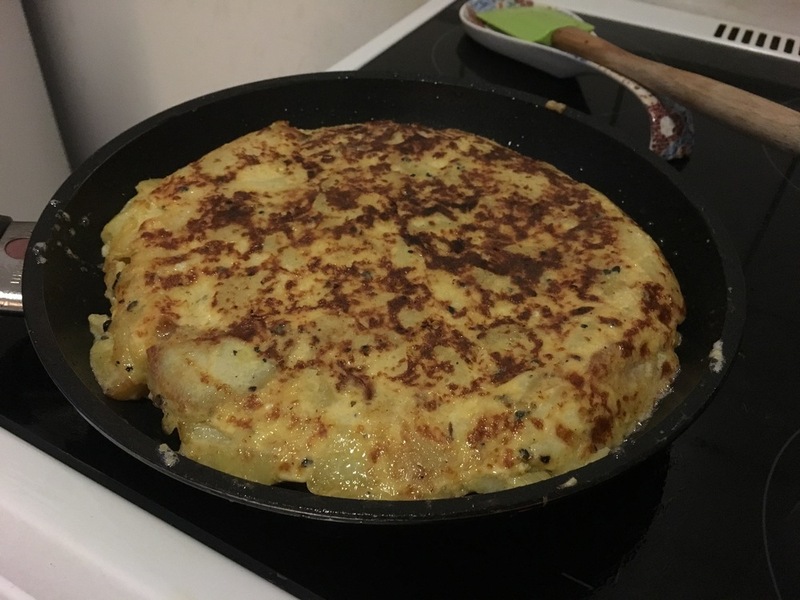 I like to cook fairly often, and on nights when I'm craving potatoes, Spanish tortilla usually comes to mind. I picked up this recipe at our Espai Boisà cooking class in Barcelona two years ago. 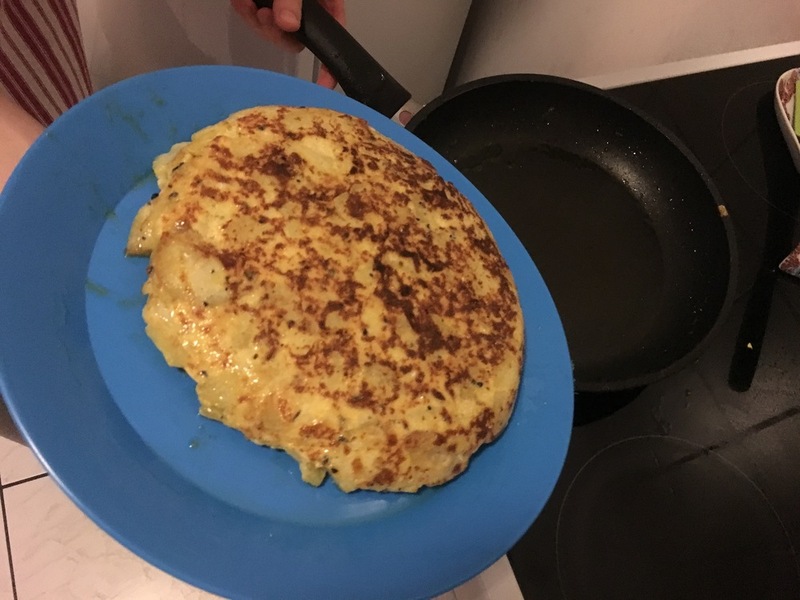 I hadn't eaten Spanish tortilla before that trip, let alone made it, but after taking a lead role in making the tortilla at our cooking class, I felt confident enough to continue making the dish at home. The tortilla takes a bit of time to make, but the recipe itself is super simple and relatively inexpensive. It's made with just five ingredients: potatoes, onion, eggs, extra virgin olive oil, and salt. The trick is being patient while the potatoes and onion cook in the olive oil (30 minutes) and then waiting for them to drain (at least 5 minutes) and soak in the beaten eggs (15 minutes). Once the mixture is ready, it takes some skill to flip the tortilla, but I've gotten better with practice -- and with the help of a thin, blue plastic "tortilla flipper" that a friend picked up for me on her last trip home to Spain. She says they're super cheap and available all over Spain, so it's definitely worth picking up one if, like me, you start making lots of tortillas. It's made my tortilla flipping much easier than with a plate and way less messy. As our chef instructor at the cooking class explained, you can cook the tortilla for a minute or two on each side to get a more liquidy center, which many people like. If you want to make sure the egg mixture cooks all the way through, though, then you should leave the tortilla on a low heat for longer after you flip it. Either way, when you slice into the center, the texture should be soft and dense and the taste should be pleasantly salty with more potato and onion flavor than egg. I've included the basic recipe at the bottom of this post. Though the recipe calls for a lot of olive oil, which can be expensive, you can reuse the oil from one tortilla to the next. In fact, we have a special glass jar in our pantry with olive oil just for tortilla. This helps to make the cost of the dish just that of the potatoes, an onion, and some eggs, which is not much at all! Over the years, I've also modified this recipe by adding ingredients like cheese and ham (preferably a nice Spanish manchego and jamón serrano). I imagine you could add all sorts of vegetables, too. I like eating it best just after it's cooked with other tapas or salad. My husband also really likes eating slices of it on pan con tomate (the Spanish-style toast rubbed with tomato that we also learned how to make in our cooking class). This recipe makes a dense 8" tortilla, so it's enough to serve about six people. Any leftovers (which we usually have after the two of us have our fill) will keep in the fridge for 2-3 days and tastes delicious cold or at room temperature the next day for lunch. It's also a really easy dish to prepare the night before and then bring to work the next day for work parties, although you may not want to share it after you try it! Mix potatoes and onions together into a bowl. Add salt to the mixture. In another bowl, beat the eggs. Add salt to taste. Heat the olive oil at a medium level. Add the potatoes and onions to the frying pan. The oil should almost cover the potatoes. Make sure the oil is not too hot (160 - 170 ͦ C), otherwise the potatoes will brown rapidly on the outside, but will still be raw on the inside. Cook for about 30 minutes. Once cooked, remove the potatoes and onions from the pan with a slotted spoon or sieve. Let them cool and drain for about five or so minutes. Then, add them to the mixture of beaten eggs. Leave the mixture to rest for 15 minutes at room temperature. This will allow the potatoes to absorb some of the egg mixture. In a small, non-sticking frying pan, pour 1 teaspoon of extra virgin olive oil at medium heat. Add the potato and egg mixture to the pan and give it a quick, vigorous stir with a spatula to ensure the eggs cook faster in the middle, then leave and allow the mixture to cook around the edges. Carefully lift up one side of the tortilla to check if the base has slightly “browned”. The eggs on the inside of the mixture will still be runny. Once the bottom can easily slide in the pan, it's time to flip! Place a large dinner plate upside down over the frying pan and hold firmly with your hand wide open. Quickly flip the frying pan over, transferring the tortilla onto the plate. Using a spatula, slide the tortilla back into the frying pan and shape the sides of the tortilla. Let it cook for 1-2 more minutes, depending if you like the inside of your tortilla runny or well cooked. Transfer to a plate and slice into 6 pieces like a pie. Enjoy!